Learn how to find your way in the new Parkland. 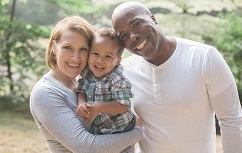 At Parkland, our patients are at the heart of everything we do. That is why the new Parkland hospital was designed with your needs in mind. Today, Parkland remains one of the busiest public hospitals in the nation, with more than 1 million patient visits each year. But demand for Parkland services continues to grow. The new 2.8 million-square-foot Parkland campus is located on the northeast corner of Harry Hines Boulevard and Medical District Drive. At nearly twice the size of the old hospital, the new Parkland has been designed to meet the ever-changing needs of Dallas County – one of the largest, fastest-growing regions in the country. 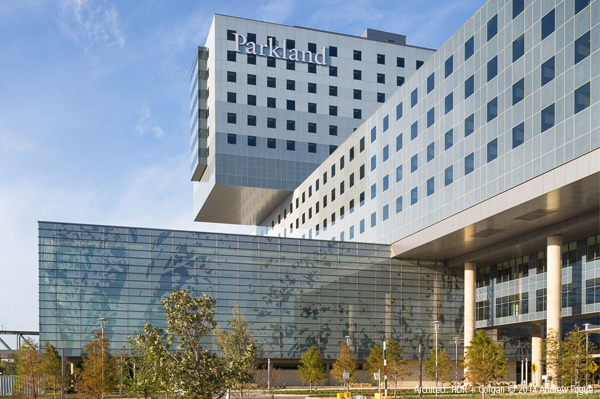 Every aspect of the new Parkland hospital was thoughtfully planned to enhance the patient experience but still preserve safe, quality care. Our leaders traveled across the country to visit other successful hospital building programs. What we learned from those experiences give Parkland’s patients the best medical facilities Dallas County has to offer. See some of these facilities in this video tour from the Irving Community Television Network. The 870 single-patient rooms with private bathrooms and space for families and visitors offer just one example of the improvements for patients in the new hospital. The new campus also promotes an environment of healing by incorporating natural lighting and a wellness garden. One of the many distinct design features is the image of trees on the lobby glass. When seen closely, the trees are actually made of the names of the thousands of Dallas County citizens who support Parkland. You can see more details about the new Parkland by looking at the project's history. Throughout the construction of the new hospital, we have worked to make Parkland a place that makes the citizens of Dallas County proud. By using responsible financial strategies, we have built a first-class hospital that not only creates jobs, but allows us to invest dollars back into the community. 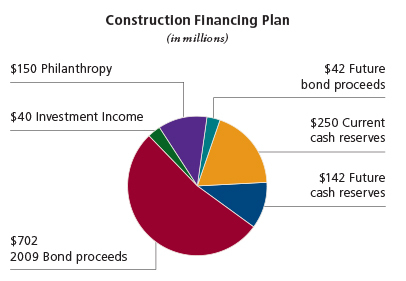 The funding used to build the hospital comes from many sources, including cash reserves and philanthropic support. The new Parkland opened on Aug. 20, 2015. If you want to help support critical patient services in the new Parkland, join us and stand for Parkland.